As with grooms, guide curves are created outside of the graph context and imported as data. A guide curve can be any nurbs curve created within Maya, thus it’s up to the reader to be comfortable with Maya’s curve creation and editing tools. Although the location of the guide curves are arbitrary, it’s generally good practice to have them created as close to the surface as possible and reasonably aligned ( ie. not inside the surface ). The relationship of the guide to the surface normal is taken into account when computing weights, it’s best to ensure that the base of the guide is pointing in a similar direction to the surface normal. If at any time they are pointing in opposite directions the guide will be ignored. To use guide curves within a graph you first have to place them within a Maya set as you will be referencing a guide set vs. individual curves. With a guide set created use the Input Guide Sets palette on the Yeti node to assign new sets to the node. As with all data a new Import node will need to be created and in the attribute inspector change the mode to Guides and provide the correct name for the set. A Guide node is generally used to deform the fur along the input curves, you also have the option of clumping the hair around the guide curves via new attributes Yeti creates on the input curve shapes ( see below for reference ). It is also possible to preview the guides falloff in the Maya viewport via the Display Guides toggle in the Yeti nodes Display palette. 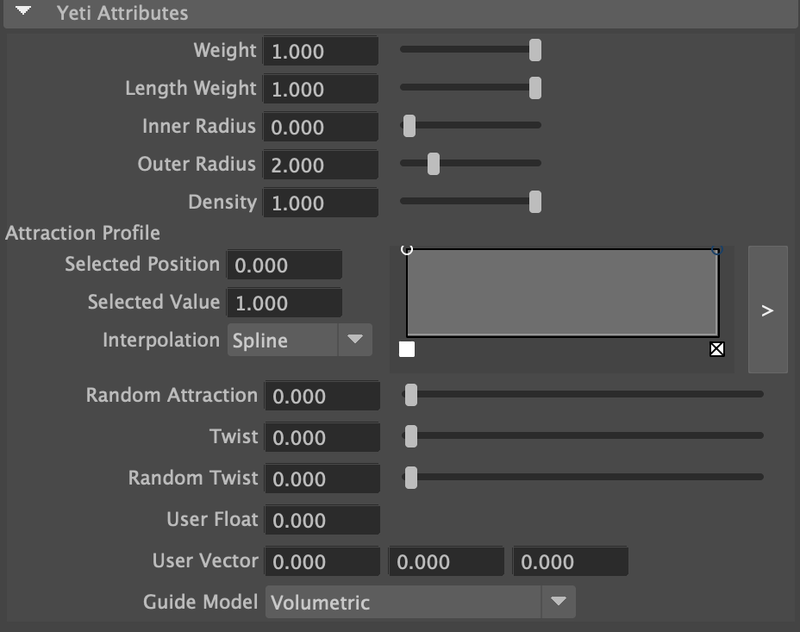 As with the Groom node, imported guides can be used to set the density and length of the generated fibers, just connect the output of the guides Import ( or merge with a Groom ) to the Scatter and/or Grow node for similar results. The Maya curves are considered live data in the graph with any and all changes causing an interactive update of the graph. By default the guides are sampled based on their global position assuming that they may be rigged and used dynamically, the other option is to treat the guides similar to grooms and assume that their initial relationship to the surface should be maintained even if deforming. Once a curve set has been added to a Yeti node each curve shape in the set will be given attribute used to control the effect of that curve. Inner/Outer Radius adjust the fall off of the effect, any fibres within the inner radius will be affected fully and outside of Outer Radius will be unaffected. As with any input geometry Yeti provides a means of creating a rest position for guide curves that ensures their relation to the underlying surface is maintained. To create the rest position make sure you have either the individual curves or the whole guide set ( to apply the rest position in one go ) selected and use the Save Guides Rest Position item from the Yeti menu. Be aware that if your guides default ( rest ) position changes you will need to re-save the rest position. To remove the rest position data select the curves or set as before and use Remove Guides Rest Position item from the Yeti menu.